There are some general misconceptions about typhoid fever, a disease caused by Salmonella typhi. However, this article intends to provide more information about the disease and its causative agent, so that people may know more. You probably know some already. Typhoid fever is a type of salmonellosis, caused by the Salmonella typhi. S. typhi is a species under the Salmonella genus, and there are many other species that can cause typhoid fever-like sickness such as S. enteritica, S. bongori, and S. paratyphi. Most of these species actually produce short-lived and mild infections, except for some like S. typhi which can progress to higher fever, severe headache, abdominal pain and other severe symptoms. 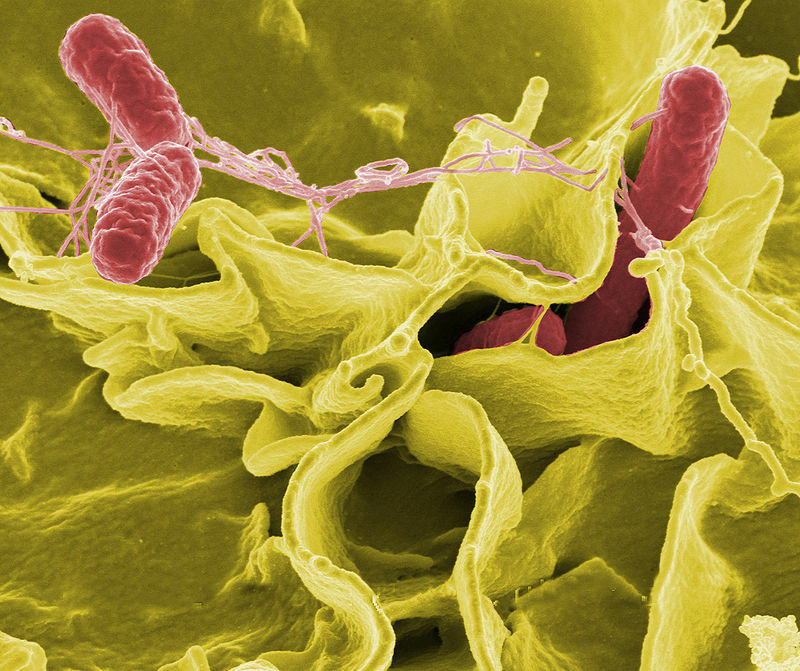 Most Salmonella spp, are killed by stomach acid, hence, a large number of the organisms has to be ingested to survive and cause infection in the gut. Even those which survive the acidity of the stomach eventually got ‘eaten’ up and killed by immune cells such as macrophages which further prevent infection except if the number of ingested microbes is large. Sometimes, it is the immune responses to the infection through inflammation that leads to dissemination of the disease and the diarrhoea which occasionally accompanies typhoid fever. S. typhi is not easily killed by the immune system, being resistant to ingestion and killing by macrophages. They can even multiply within these immune cells, and be disseminated throughout the body by them, causing septicaemia, and even haemorrhage. People can easily and unknowingly get infected through foods and water contaminated by faeces of chicken and ducks, especially their eggs and undercooked meats. S. typhi typically colonises the gallbladder of humans, and this is the source of the organisms for carriers and those with recurrent infections. In fact, surgical removal of the gallbladder is usually necessary to completely cure the infection in some carriers! Adequate cooking effectively kills Salmonella spp in foods, especially poultry animals, and most times, infection occurs when the heat do not penetrate enough to reach the center of the cooked animal. Usually, salmonellosis infection usually resolves without treatment. However, over the years, the abuse and misuse of antibiotic drugs have been making most of these organisms resistant to treatment. There is an attenuated, oral vaccine for preventing typhoid fever with 50-75% effectiveness. If you suspect typhoid fever after for a prolonged period, or if symptoms persist, ask and consult your doctor for more information. Hope these have been helpful. Stay healthy.